Jie Gao, chair of the Asian Linear Collider Steering Committee summarises the progress achieved in Asia in the last months towards the realisation of the ILC. Participants of the Conference “Windows on the Universe” held at Quy Nhon, Vietnam. The official completion of the technical design for the International Linear Collider on 12 June 2013 marked the start of a new boosting engine for the ILC. The ILC was launched in 2005 in Snowmass, Colorado, after it was baptised in August 2004 at the technology decision by the ITRP panel. Now all engines are concentrating to boost the ILC towards its orbit. From 16 to 19, July the third Asia-Europe Physics Summit (ASEPS3) was held, during the 12th Asia Pacific Physics Conference of the Association of Asia Pacific Physical Society (AAPPS) in Chiba, Japan. The emphasis of the physics summit was put to international strategic planning for large research facilities with researchers and policy makers from Asia, Europe and the US. participating into round table discussions. From 11 to 17 August, a workshop about “Windows on the Universe” was held at the International Center of Interdisciplinary Science Education (ICISE), QuyNhon, Vietnam. More than 180 scientists participated, including five physics Nobel prize winners. 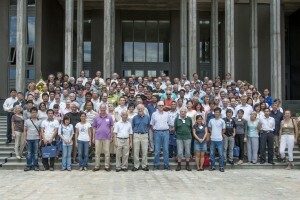 The status and the future of high-energy physics was presented and discussed. Barry Barish, former ILC Global Design Effort Director, gave a keynote summary of this impressively high-level scientific workshop. The July meeting concentrated on strategic scientific policy while the August one concentrated on particle physics itself. The meeting conclusions stated that the ILC was surely one of the key tools for particle physics with its unique feature of being a truly global large research scientific facility with a great physics potential to open the “Window on the Universe”. On 3 September, the Asia-Pacific High Energy Physics Panel (AsiaHEP) and Asian Committee for Future Accelerators (ACFA) jointly issued the statement that the ILC is the most promising electron positron collider to achieve the objectives of next-generation physics. This statement is a milestone and it will guide us to the next converging steps. The ILC is a e+e- high-energy-frontier collider with clear physics goals and big potential, a genius accelerator with the most technological impact to multi-disciplinary sciences in general. But the ILC is even more than that. It is a new way of doing particle physics: a totally new organisation, a totally new structure, a totally new scientific way of life, and a totally new human culture. ILC will become to science what the Olympic Games are to sport, with the same humanistic and peaceful spirits. From 11 to 15 November, the next global Linear Collider Workshop (LCWS13) will be held in Tokyo. We hope we will achieve new step forward there, and, as Tokyo is the host city for the 2020 Summer Olympic Games, let’s hope the ILC becomes a reality after Tokyo Olympic Games in 2025.